Dear Devil May Cry fans: know that I am one of you, for the most part. A guy who played DMC1 gleefully, suffered through 2, was comforted by 3 and ignored 4. So let me declare that I think there's nothing to worry about with the upcoming DMC reboot. You jump, shoot and slash with style. It's fast. It's pretty. It's Devil May Cry. The mission I saw today on view is midpoint through the game and has Dante sauntering into a nightclub run by a demon named Lilith. The netherworld villainess sets up human/demonic alliances and Dante goes into her devil-disco to assassinate her. From the very start, new Dante displays the same cocky attitude as old Dante, only with more cussing. Lilith refers to him as Son of Sparda, too. 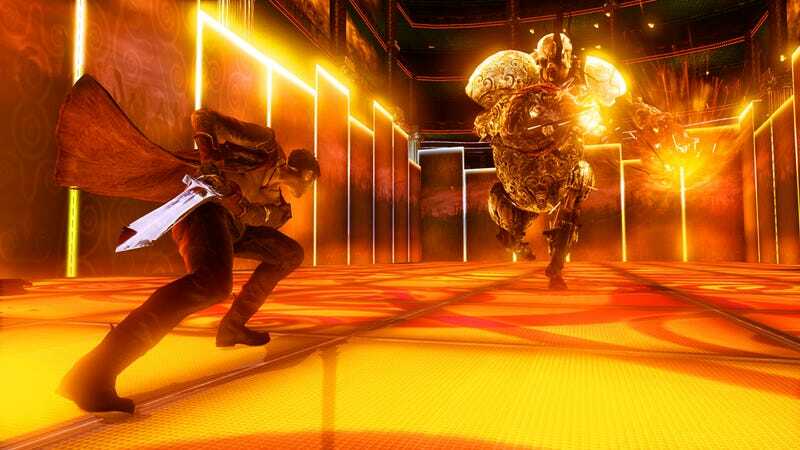 The fights start right away and showed off the mix of weapons and attacks that you'll be able to bring to bear instantly in DMC. Weapons come imbued with either angelic or demonic properties and you'll need to change up which one you're using depending on the enemy you're facing. Dante's first weapon is the Rebellion sword, which comes from within him early in the game. Other implements included angelic axe Arbiter—a heavy option where the more strikes you get without being hit, the more powerful the weapon becomes—demonic sword Osiris and the classic Ebony & Ivory pistols. Lilith was dubbed the Simon Cowell of Limbo netherworld during he demo and this level becomes a game show called The Devil Has Talent. The deeper Dante goes, the more psychedelic and dangerous Lilith makes it. An opening battle against lesser enemies gave way to an arena fight against two flying opponents and a tank type. A later part had a time limit, requiring Dante to defeat all enemies in 30 seconds or the floor falls out, leading to a game over. All enemies will require a strategy; some are best hurt by angel weapons, for example. And some platforming moments were tuned to angel and demon modes and you'll need to hold left trigger, for example, to cross angelic floors safely. In each fight, the jumps, juggles and dodges recalled old Devil games but newer animations with updated flair. And you still get graded on style, which gives you points to upgrade weapons. It's already been noted that the Devil Trigger power-up makes new Dante look a lot like his white-haired predecessor. It also makes him faster than enemies, with full health regeneration and more powerful attacks, too. The new DMC comes from a partnership between the Ninja Theory dev studio—makers of Heavenly Sword and Enslaved—with Capcom's producers. On hand were Tameem Antoniades from Ninja Theory and Motohide Eshiro from Capcom and Antoniades said that Ninja Theory's contributions have been to set this new game in the real world, introduce elements of satire and refresh the look and feel of the hero to make Dante feel more modern. But what I saw today testifies to the fact that much of the DMC DNA comes from the Devil May Cry titles that came before it. So who cares if the new guy's hair is a different color? I sure as hell don't.